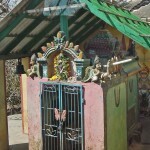 There were lots of images of Hanuman around where we were in the hills. I come home after this long break–far enough away and for a long enough time to be able to gain perspective–and think, given that I have dedicated most of my career to public service, about how the myth of Hanuman may inform my ongoing contemplation at this time in my life and in this socio-political climate of how I can best contribute and participate. 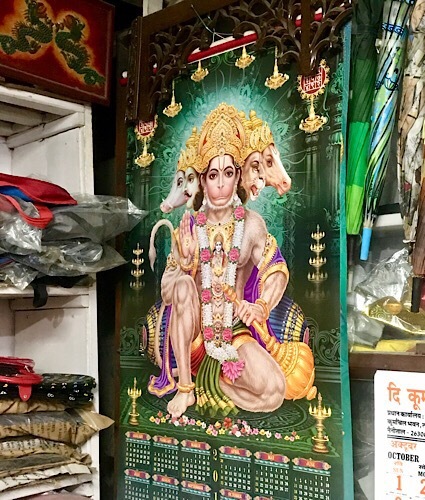 Hanuman is the faithful servant; I think that one aspect of his story is that in being true to Rama, he is being true to dharma, to law and culture. In loving and protecting Sita, he is recognizing nature. Only when he is acting in service to them and others can he access his true powers (siddhis). The first demon Hanuman encountered was Mainaka, a golden mountain who rose up out of the sea. She gave Hanuman a place to rest. She was helper. But she was also demon in that she wanted Hanuman to stay and rest with her and to give up his journey. Some of the stories characterize Mainaka only as a helper, and not as a demon. If Hanuman had become stuck in the comfort Mainaka offered, though, and failed in his journey, she would have been for him the demon of complacency. The question Sianna left with us to consider about Mainaka was where have we been too comfortable? Where do we need to express gratitude and appreciation, but move on? The second demon, Surasa, was a fierce water serpent who emerged from the water to swallow Hanuman up as he was flying over the ocean. To escape, he first tried making himself so big that she Surasa could not swallow him, but she just opened her mouth wider and wider, gnashing at him with her razor-sharp teeth. 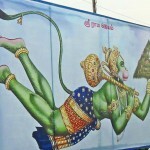 Hanuman escaped by then shrinking himself to the size of a dust mote and flying out from between Surasa’s teeth. Being able to make himself immense was one of the powers he needed to be able to fight the various demons, but he needed also to be willing and able to make himself small to complete the journey. He would have been stuck if he had not been capable of taking on different shapes and approaching things from different perspectives. Surasa may have tried to swallow him up, but she also taught him perspective. “Are there places where you could use more perspective?” asked Sianna. The third demon , Sinhaka, at least according to some versions, tried to eat Hanuman’s shadow. Inseparable from his shadow, the only way to escape was to turn back to face and claim his shadow as his own to battle Sinhaka. Running away would have just kept Sinhaka champing at his tail and dragging him back from success. We have to recognize and face our shadows in order to be complete and to understand the full spectrum of being. We were invited to ask whether there were particular fears from which we were running. What stayed with me, and has me still thinking about the workshop, was that the emphasis was on treating ourselves and the obstacles we face on and off the mat with compassion. We often give lip service in Western tantra to seeing the good or the necessary in our demons. For example, whereas classical yoga thinks desire needs to be eradicated, tantra recognizes both that we would not get out of bed in the morning without it and that desire is what can lead us to practice and seek spiritual connection. When we can truly look at our demons (both our own personal ones and those we see in both wider and more intimate relationships), our demons are not evidently nor necessarily to be slain or eschewed or to be seen as only malignant or pestilent. When we approach our own demons and those of others with true compassion, we open the possibility of change through deeper awareness, connection, and recognition of humanity.